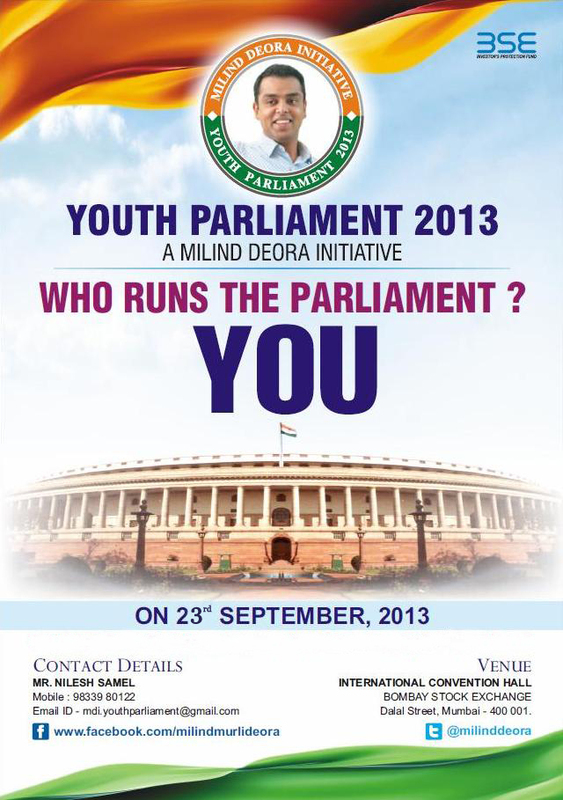 As a part of Milind Deora Inititative (MDI), we have organized ‘Youth Parliament’ at the Bombay Stock Exchange Building. Our chief guest, Shri Sachin Pilot (Minister of State for Corporate Affairs) could not make it on the 21st of September due to some urgent programme. We have hence changed the date to 23rd of Sept, 2013 (Monday). We have made every effort to recreate the dignity of the Parliament during the event. May we request an RSVP to mdi.youthparliament@gmail.com to enable us to make proper security & other arrangements at the venue. Click here to download the YP 2013 agenda for your reference.